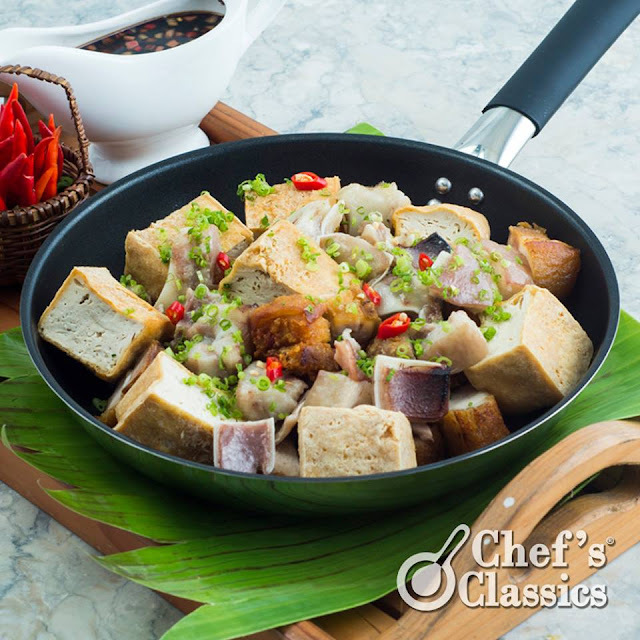 We’re feeling our Pinoy pride flowing, so we decided to share a recipe for a kainan classic. Today, make a tokwa’t baboy serving that everyone will enjoy. Your guy will surely be smacking his lips after tasting this. 1. In a stock pot, boil the pig’s ear and pork belly for 45 minutes or until tender. 2. Heat the oil on a Chef’s Classics Lavender Frypan over medium heat. Fry the tofu and belly until golden brown. 3. Cut the fried tofu and belly into cubes and slice the boiled pig's ears into bite-sized pieces. Set aside. 4. In a small bowl, combine the vinegar, soy sauce, calamansi juice, sugar, salt, ground black pepper, onions, green onions and chili pepper. 5. Transfer the sliced meat to a serving plate and serve with the sauce.